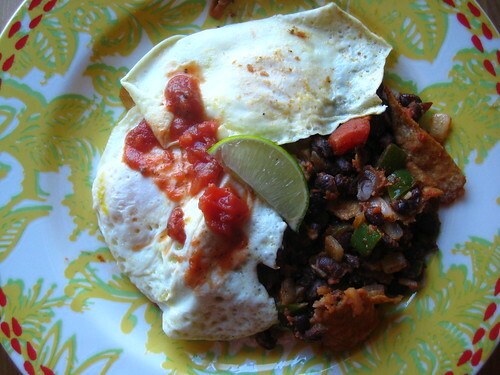 My version of huevos rancheros. I stumbled upon this breakfast by accident (which, I've decided, is the best way to find a new favorite food). After spending several days at my parents' house for the holidays, I came back to my dark little apartment only to find a pathetically stocked fridge. No big deal-- we went out for dinner and put off grocery shopping another day. But then morning rolled around, and I wanted eggs for breakfast (big surprise there). A quick dig in the fridge and pantry revealed two eggs (score!) and nothing to serve them with (boooooo!). No toast, no rice, not even ramen. So I dug a little deeper. I found a lonely can of black beans hidden in my pantry among stacks of canned chicken broth, stewed tomatoes, and tuna. There was a jar of salsa in the fridge, along with the remainder of an almost-slimy-yet-still-edible green pepper and the last quarter of an onion. And plenty of whole wheat tortillas (I knew they'd come in handy when I bought them on an impulse). 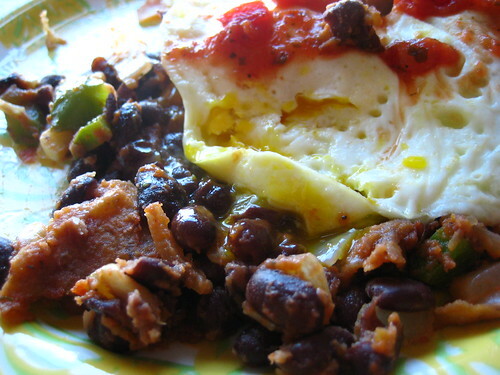 Looks like I was making my own little version of huevos rancheros. I heated up a skillet with olive oil and butter and sauteed the veggies with garlic until soft. Then added the drained and rinsed black beans, which I mashed a bit with a fork. A few spoonfuls of salsa went in, as well as torn up pieces of tortilla. Seasoned with salt and pepper, topped with two fried eggs and a lime wedge. Ahh, now does that plate just really bring out the salsa nicely? I think so too. Oh yeah, nice huevos rancheros. You cooks amaze me as to how you can scare up an awesome meal out of nothing! I love accidental breakfasts, they always turn out the best. Yours looks great! j - i love those plates. whoever picked them out has lovely taste. My most favoritest cookies in the world. Prime rib dinner on the Eve. Everybody loves pancit and eggrolls.